When are Second Chance Toys collections conducted? What kinds of toys does Second Chance Toys accept and donate? Do you take battery-operated plastic toys? I have toys at home I no longer want. How can I get them to Second Chance Toys? Can you pick up the toys I have? How can I get involved with Second Chance Toys? Will Second Chance Toys give me community service credit for my efforts? What is the best way to collect toys? Are there costs involved in preparing toys for donation? Can you help me find an organization to donate my toys to in my area? I would like to volunteer, how can I help? Where do I bring my toys? There isn’t a drop-off location near me, what do I do? I have toys to donate but it’s not during your two collection periods. Can I still donate now? Do you take books or stuffed animals? Can you pick up my toy donation? Do you know of organizations who will take other than just plastic? Q: When are Second Chance Toys collections conducted? 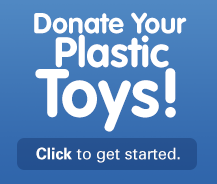 You may donate your gently used plastic toys twice a year. Collections only take place in April for Earth Week and December for the holidays. Q: What kinds of toys does Second Chance Toys accept and donate? We accept plastic toys (they don’t biodegrade in landfills) that are clean, are in working order, and have no missing or small parts (cannot fit through a toilet paper roll). Q: Do you take battery-operated plastic toys? Yes. Please check that the batteries work or include fresh batteries with your donation, as the recipients are not in a position to buy replacements. Q: I have toys at home I no longer want. How can I get them to Second Chance Toys? Check out the drop-off locations to find a donation site nearest you. If you cannot find a drop off in your area, consider starting your own collection, or if you have 50 or more plastic toys, contact us so we may arrange for you to donate your toys directly to an organization. Q: Can you pick up the toys I have? We are so busy coordinating, preparing, and donating toys to children in need, it becomes difficult for us to pick up all the toys that are available. We appreciate your assistance in taking the time to drop off the toys at a local collection site or to an organization, if you are collecting toys. Q: How can I get involved with Second Chance Toys? There are many ways to get involved: Create your own initiative to collect toys with friends, family, your business, Girl or Boy Scout troops, religious groups, schools, or other members of the community. Check out our Getting Started Kit to see how easy it is to host a collection. Or you can volunteer your time to help us identify organizations, update our database, write press materials, contact the media, and more. Spread the word to create a groundswell of support by encouraging others to visit us to learn more. Q: Will Second Chance Toys give me community service credit for my efforts? Yes, Second Chance Toys will provide a certificate for your community service hours. You will need to fill out a community service form to provide proof of your hours along with the consent of a supervising adult. Q: What is the best way to collect toys? The best way is to organize and publicize a toy drive in your community. Enlist the help of your school, religious group, apartment building, local business, or other organization to provide a location for drop-off. Keep an eye out on garbage day and for post–garage sale discards; talk to your friends and members of your community; and get donations through word of mouth. Another great way to collect lots of toys in a short amount of time is to find out the dates for bulk trash days in your local communities. You will be amazed at how many toys you can collect in just one hour. Make sure to start out with an empty car! Please refer to the Getting Started Kit to see how easy it is. Q: Are there costs involved in preparing toys for donation? No. All it takes is your investment of time. In fact, we provide resources in the way of flyers and posters, signage, press release templates, and access to our drop-off location finder to make your efforts easier. Q: Can you help me find an organization to donate my toys to in my area? If you are collecting toys, we will put you in contact with an organization in your area. If you are donating toys, please go to drop-off locations. If you cannot find a drop-off location near you and have 50 or more gently used plastic toys, we will find an organization for you. Please go to collect toys to learn more. Q: I would like to volunteer, how can I help? Thanks for thinking of Second Chance Toys. You can hold your own toy collection by clicking here, or register to volunteer your time in a different way by clicking here. Be sure to list your interests and skills! Q: Where do I bring my toys? Thanks for thinking of Second Chance Toys. We collect toys twice yearly, once during Earth Week and again in November/December for the holidays. Please click here to find a drop-off location near you during these time periods. If you have 50 toys or more, click here and we will match you with a recipient organization directly during our current collection period. Q: There isn’t a drop-off location near me, what do I do? Thanks for thinking of Second Chance Toys. We depend on our volunteer collectors to open their toy collections to the public so that we can list them as drop-off locations. If you do not see one in your area and you will be able to collect 50 toys or more, please consider holding your own toy collection by clicking here and we will match you with a recipient organization directly. If you do not think you can collect at least 50, please check back soon as we will continue to add drop-off locations as collectors sign up. Q: I have toys to donate but it’s not during your two collection periods. Can I still donate now? Thanks for thinking of Second Chance Toys. The time between our two collection periods allows for our recipient organizations to distribute their donations so that they are not overwhelmed with lack of storage. We will not be able to accept your toy donations during the off season, but we encourage you to hold on to them so that we may assist you during Earth Week or the holidays. Q: Do you take books or stuffed animals? Thanks for thinking of Second Chance Toys. Unfortunately, we are not able to accept any toys that are not completely plastic. Please consider reaching out to your local Department of Social Services. They may be able to assist you in finding a recipient for your donations. Q: Can you pick up my toy donation? We are so busy coordinating, preparing, and donating toys to children in need, it becomes difficult for us to pick up all the toys that are available. We appreciate your assistance in taking the time to drop off the toys at a local drop-off location or to your assigned recipient organization. Q: Do you know of organizations who will take other than just plastic? Thanks for thinking of Second Chance Toys. Please consider reaching out to your local Department of Social Services as they may be able to direct you to an organization who could use your donations that are not plastic. Q: How do I sign up to receive your newsletter? Thanks for thinking of Second Chance Toys. Please click here to follow our efforts.